This is the second in a weekly series of blog posts that will feature medical students telling their story of how they got into medical school. 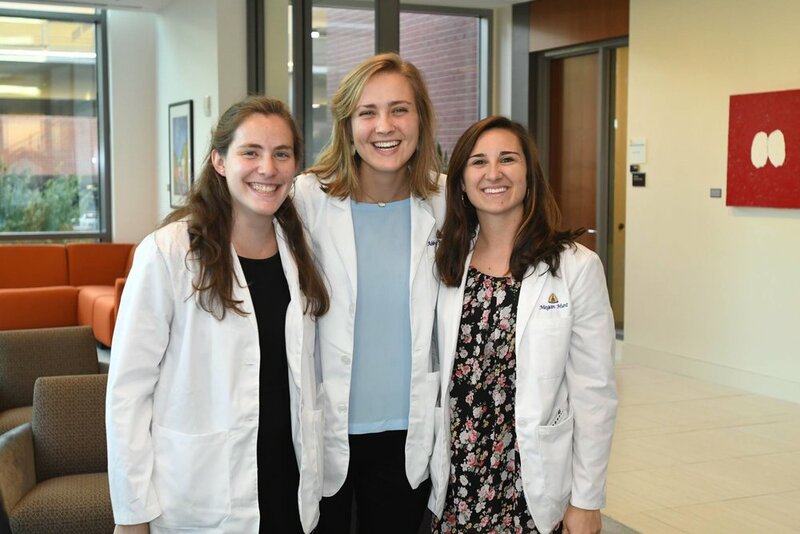 Today, Abby Fahnestock shares with us the captivating story of her acceptance to the Johns Hopkins University School of Medicine class of 2021. Abby, give us a peek into your life. What initially attracted you to pursue medicine? I will touch on this text throughout the following questions and responses; however, it will suffice to say that the desire to be “fully possessed by the glory we behold” and “liberated from a small hungry shivering self,” have been significant motivators throughout much of my life. "...it will suffice to say that the desire to be 'fully possessed by the glory we behold' and 'liberated from a small hungry shivering self,' have been significant motivators throughout much of my life." I grew up in Detroit, Michigan. I spent much of my childhood swimming competitively and reading books. I developed a love of story early on in my life – which has informed much of my desire to go into medicine. I lived in the Washington D.C. area throughout high school, and was involved in different varsity sports and student government. I then received a B.A. in University Scholars from Baylor University, where I concentrated in Medical Humanities, Great Texts of the Western Civilization, and Spanish. As can be seen in my choice of major, I was not the typical pre-medical student in college. I did not involve myself in any of the nationwide pre-health organizations and did not spend time doing bench research. Instead, I involved myself in my church, I was a co-founder of a pre-health organization that explored the intersection of faith and medicine, I trained for different running races with friends, I spent a semester studying abroad in the Netherlands, and I joined a sorority. During my summers throughout undergrad, I pursued what I was passionate about and knew I would not get the chance to do again. I worked as a camp counselor for middle school kiddos one summer. I helped with clinical research at a pediatric clinic another summer. I also travelled to Kenya and later worked for the Chief Medical Officer of a hospital in Dallas, Texas, helping with surgical site infection research. As one might guess from what I involved myself throughout undergrad, much of my initial attraction to medicine was due to my wide variety of interests. I love literature – I learned that in medicine you get the privilege of listening to story after story with every patient you encounter. I love learning – I learned that in medicine you never stop learning. I love teaching – I learned that in medicine you get to teach your patients and your peers. I love the gift of helping others – I learned that in medicine, if done well, you have the gift of intersecting with people’s lives in some of their most vulnerable moments. Therefore, I was initially attracted to medicine because I found no other profession that combined interpersonal excellence, technical skill, and the thrill of studying the intricate body. Throughout high school and undergrad, I shadowed many physicians to learn these characteristics of medicine – and decided that I would love to spend my day-job practicing medicine. Why did you choose to apply to the Johns Hopkins University School of Medicine? "I decided that I owed it to my future patients and to myself to become the best physician that I possibly could, and that necessarily included getting the best education and most exposure possible." I applied to Johns Hopkins Medical School, along with 15 other schools, during the summer between my junior and senior years at Baylor University. I applied to Johns Hopkins for quite a few reasons. If I am being completely honest, I initially applied because of the prestige of the program. However, after I was accepted to Johns Hopkins, I began learning more about why Johns Hopkins was where I wanted to go. I decided that I owed it to my future patients and to myself to become the best physician that I possibly could, and that necessarily included getting the best education and most exposure possible. I learned that if I wanted to become a leader within the field of medicine, the medical school that I picked would serve as a launching pad. I am passionate currently about using my medical degree as a platform to advocate for those who have no voice, specifically those with profound intellectual or physical disability. I knew Johns Hopkins would give me an incredible platform from which to do this and also expose me to a lot of challenging thought and research within the field. That is a great question – I ask myself this daily! In all seriousness, I think this is a difficult question to answer. How does one not get a secondary application from Vanderbilt, and yet get accepted to Johns Hopkins? Much of the process is hard to interpret; however, I will speak simply from the perception I received as I interviewed. When I sat down with my Hopkins faculty interviewer, he threw my application on the table and let out a long sigh. He looked at me and said the following: “I read countless applications. Every applicant is interested in ‘helping other people’ and every applicant has a desire to change the healthcare system. You also want to help people and be a leader in policy change, but there is something different in your application. As I read about your time in Kenya, I knew that you left changed. You did not go to fill your resume, but rather you went because you are truly passionate about people – and I can see it in your writing.” All this to say: interviewers can read through the essays – therefore, only write what you are passionate about – only do what you are passionate about. This will lead to my second reason I believe I got it, and that is because I took a very non-traditional approach to medical school. I was not involved in the “mandatory” pre-medical organizations (there is nothing wrong with them, I was just not interested). I did not major in biology (not because there is anything wrong with that – we need people to major in biology – but because I was not interested!). I definitely do not have all the answers, but during an interview it becomes very obvious whether or not one is simply intrigued by the idea of going into medicine or is committing to making medicine better. Lastly, I believe I got into Johns Hopkins because I had thought deeply about healthcare policy, the future of healthcare, and my role in shaping the future of medicine. I definitely do not have all the answers, but during an interview it becomes very obvious whether or not one is simply intrigued by the idea of going into medicine or is committing to making medicine better. I have strong opinions about different policies and principles that are operating within modern medicine and I took a stand for what I believed in throughout the interview. Therefore, I think my ability to speak about how I envisioned myself contributing to and shaping the field of medicine helped me get into Johns Hopkins. "I was afraid to admit it to anyone, but I thought the faculty interviewer would try his best to get me in." After my Johns Hopkins interview, I felt wonderful. I was afraid to admit it to anyone, but I thought the faculty interviewer would try his best to get me in. I already touched on the nature of how the interview went in the previous question; however, I will add that as I left the interview room, my interviewer said: “I cannot wait to read the book that you will write during your time at Johns Hopkins.” I was, needless to say, shocked, as I left the room. However, the other parts of my interview day were difficult to interpret. Though the faculty interview went well, much of the rest of the day felt like a failure on my end. I did not feel like I connected well with the other interviewees or students. I also met certain faculty members that rubbed me initially the wrong way. I also was unimpressed with Baltimore as a city. Therefore, I left unsettled about how the entire day went. This made it incredibly difficult as I made my decision whether or not to go to Johns Hopkins. However, looking back, it is almost comical as I think of my fears in not connecting well with other students and not loving Baltimore, insofar as those are two of the best things about Hopkins. I am thoroughly impressed by everyone I meet at Johns Hopkins: faculty, staff, and peers. I also love Baltimore and could see myself living here for a long time. Take us through the moment you found out you got accepted. I remember sitting at the kitchen table with my family when I saw my phone light up across the table and start vibrating. I do not understand iPhone technology, but sometimes it will guess who is calling by saying “Maybe: _____.” In this case, I did not know the number, but it said it was from Baltimore, MD and from “Maybe: V. Mazza.” I did not pick up the phone, but instead quickly googled “V. Mazza, Baltimore.” First thing to pop up was V. Mazza: Admissions Director at Johns Hopkins School of Medicine. I panicked and could not touch my phone for at least 5 minutes. I then got the courage up to return her call. Ms. Mazza explained to me that I was accepted to Johns Hopkins School of Medicine and that I would have 5 days to make my decision. (I had been wait-listed and this was her notification that I had been pulled off of the wait-list and extended an invitation to attend). In that moment I knew that I would never deny Johns Hopkins. However, I had already committed to a medical school that was much closer to friends and family, was much cheaper, and that I was much more comfortable with. It was honestly a difficult decision, but I knew that I wanted the best training possible for both my sake and my patients’ sakes. Therefore, I picked Johns Hopkins School of Medicine and could not be more grateful. I have peers who went to community college, joined the military, and are now at Hopkins. I have another peer that was an acrobat in Cirque du Soleil for 7 years and then decided she wanted to go into medicine. Others can imitate my success by choosing to never try and imitate another’s success. I know that sounds like an easy way out of the question, but I would never recommend someone to arrive at a destination such as medicine in a specific way. If there is one thing I have learned in my first 3 months at medical school, it is that there are countless paths to a myriad of destinations within medicine. Success looks incredibly different for each person. I have peers who went to community college, joined the military, and are now at Hopkins. I have another peer that was an acrobat in Cirque du Soleil for 7 years and then decided she wanted to go into medicine. I know some faculty members that went to medical schools that many people do not know exist, and ended up as top researchers and physicians at Johns Hopkins. The common thread between everyone I know at Johns Hopkins, however, is that they pursued what they were passionate about. Just as there are countless ways to practice medicine and engage in healthcare, there are countless ways of arriving. Therefore, I would suggest (though it is cliché), investing time and energy in what one is passionate about. My recommendation is to heed the advice given in the Middlemarch quote in the first question – to be fully possessed by the glory we behold – whether that be the joy of watching a child be born, holding the hand of a dying Hospice patient, living close to family and attending a medical school that is not as well known, or maybe attending one of the top medical schools and engaging deeply in the learning all-around – it will look different for everyone, but that is the beauty and excitement of it! Abby Fahnestock grew up in Detroit, MI, and received a B.A. in University Scholars from Baylor University, where she concentrated in Medical Humanities, Great Texts of Western Civilization, and Spanish. 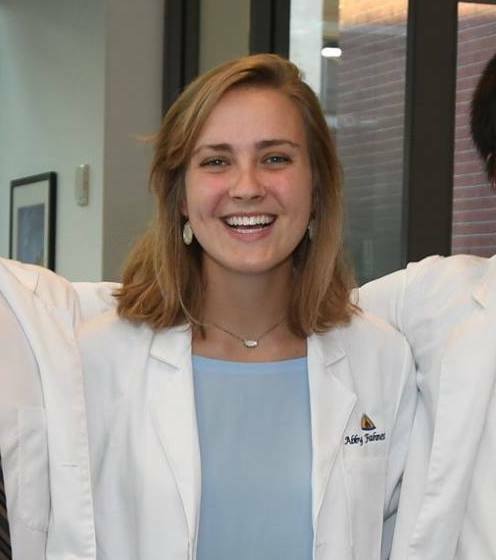 Abby is currently a 1st-year medical student at the Johns Hopkins University School of Medicine in Baltimore, Maryland. She has traveled to 10 countries, including the Netherlands, Italy, and Zambia. She likes to run and explore new cities with friends in her free time. Long term, she wants to have a family and use medicine as a platform to advocate for those with profound intellectual and physical disability.